The DEVELOP3D blog has an interesting “punch and counterpunch” exchange between KARALIT, makers of the KARALIT CFD software which features the immersed boundary (IB) approach, and established CFD vendors ANSYS and CD-adapco. KARALIT CFD solution for ASMO car body. Image from DEVELOP3D. Yesterday, DEVELOP3D posted counter-punches from ANSYS and CD-adapco. ANSYS begins by throwing a right cross at KARALIT by pointing out the IB method truly isn’t meshless, it’s inaccurate for wall-bounded flows, application of physical models becomes complicated, it’s not mature, and the immersed layer approach to resolving the boundary layer creates a new overset mesh problem when interfacing with the background Cartesian grid. The good news for us meshing folks is that ANSYS is optimistic that advances in meshing technology will eventually challenge the meshing times of the IB approach. CD-adapco follows with a left uppercut. “Sometimes, fashions lose favour for good reasons.” They also raise the accuracy issue and point out that any gains in speed are more than offset by decreases in accuracy and cite their own experience with trimmed cell meshing. KARALIT absorbs these blows and responds with one of their own. Has nothing changed in CFD over the past 3 decades? [Interestingly, Tony Jameson’s paper at the recent Future Directions of CFD in Research Conference makes the claim that CFD has plateaued for the past 15 years.] They also then respond with Aesop’s fable about the fox and the sour grapes [which unfortunately I can’t tie into my boxing analogy] and claim that ANSYS and CD-adapco are just calling IB a sour grape simply because they cannot reach it. This reminds me of the hue and cry over Exa’s Lattice Boltzman method when it first appeared on the scene in the late 1990s. And they just went public. So I’ll have to agree with the KARALIT folks when they say “let the users judge whether the grapes are sweet or sour.” I suspect ANSYS and CD-adapco would phrase that as caveat emptor. But that’s a good thing – let the software stand on its technical merits. The latest issue of CD-adapco’s STAR Academics Newsletter is out including details on how students can get STAR-CCM+ at no cost, an announcement of their academic paper contest, and articles about student use of the software. TFT Labs announced the availability of TFT4iT, a web-based application for working with 3D geometry. TYCHO Version 1.0 is now available. The software is a freely available, compressible hydrodynamics solver. Robert McNeel & Associates released openNURBS 5, the latest version of their free toolkit for accurate 3D geometry interoperability. 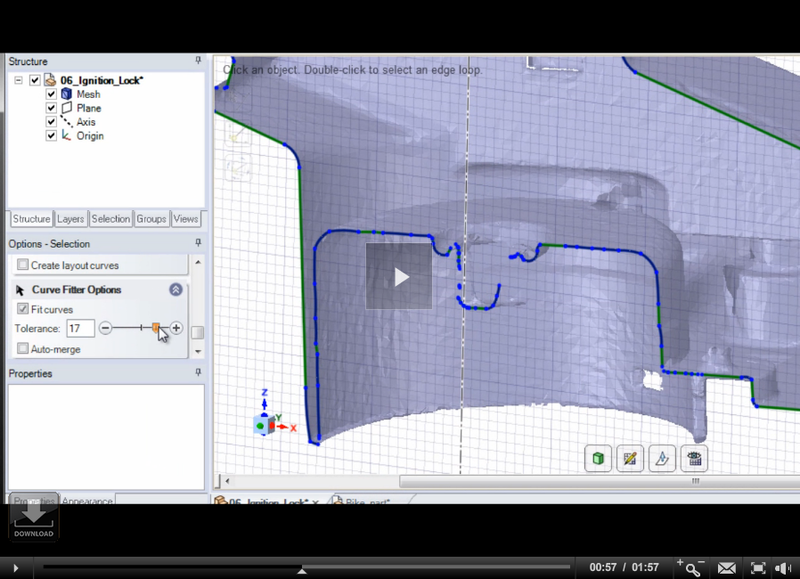 Results comparison in SolidWorks Flow Simulation 2013. ASME announced a course on CFD Fundamentals and Applications using ANSYS’ CFD software. The course will be held on Saturday 03 November in Santa Clara, CA and online. The CFD seminar schedule from the National Institute of Aerospace is available online. The NAFEMS World Congress (9-12 June 2013, Salzburg, Austria) will also host the 1st International Conference on Simulation Process and Data Management. Abstract are being accepted with a deadline of 5 November. There’s been a lot of buzz about the recent release of SpaceClaim 2012+, billed as the CAD software for people who need to use CAD but don’t want to be CAD experts. One obvious field where that might be true is CFD – we all need a geometry definition of the widget being simulated but few of us want to or can become a CAD expert. CAD is relegated to the role of a necessary evil. One can make the same comment about mesh generation. As far as features go, SpaceClaim 2012+ seems to have many new capabilities for CAM including interfaces to Mastercam and Esprit. Of special interest to me is their expanded suite of tools for working with faceted geometry (what they call mesh and STL data). It’s worth watching their video about mesh remodeling. There are core modeling improvements, Windows 8 compatibility, and other new features. If anyone is using SpaceClaim for preparing geometry for CFD I’d like to hear about your experiences. Just comment on this post. CFD in the cloud keeps Trek bicycles racing on the ground. Wartsila [umlauts omitted] used CFD to optimize the hull of their new tanker design. I’m always interested in learning more about CFD software, applications, people – just about anything. If you have some CFD news you’d like to share, don’t hesitate to email it to blog@pointwise.com. This entry was posted in Applications, Events, News, Software and tagged ANSYS, CD-adapco, DraftSight, Exa, KARALIT, NAFEMS, openNURBS, Rhino, SolidWorks, SpaceClaim, STAR-CCM+, TFTLabs, TYCHO. Bookmark the permalink. In regards to KARALIT vs ANSYS and CD-adapco, wow, that was a bit of hand waving (smoke and mirrors?) from both side. I don’t think I saw the mention of Reynolds number anywhere. And, I’m not sure how one defines “accuracy” for turbulent flow about generic geometries. I can only hope that both sides know more than what they wrote. Otherwise, that does not bode well for their knowledge base, especially in regards to the margin of error/uncertainty on a result. Martin, I’d like to think all parties in the immersed boundary methods debate know a lot more than expressed in the exchanges on DEVELOP3D. I suspect a lot of that knowledge is embodied in benchmarking. It would be great to see it and the good news is there are more and more open benchmarks by the day. Regarding NAE, anyone crazy enough to drive a wingless F-104 800 mph on the ground deserves our respect. I hope you enjoy the webinar.